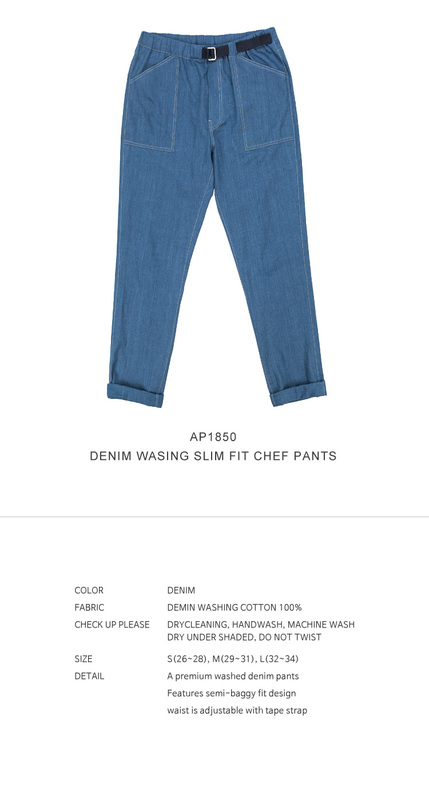 Washed enough, so less discoloration or migration of color than other normal denim. These pants are crafted after long time of research to get a fabric features, that is thin but fits nice, absorbs well the sweat, and easy to maintain having less deformation after being washed. and waist is adjustable with tape strap. The fit is slim, roll up the hems and show the cooler style. It’s cheerful to have such stitch details in premium washed denim fabric. makes you cooler and fresher. Washed enough, so less discoloration or migration of color than other normal denim. absorbs well the sweat, and easy to maintain having less deformation after being washed.